Multi-year guaranteed annuities (MYGAs) are having a moment — up 63.3% in year-over-year third quarter sales, according to one report. See why consumers are attracted to MYGAs right now and how Senior Market Sales has beefed up its focus on MYGAs so you can meet this growing demand and grow your business. 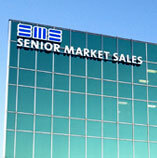 Driven by service and technology, Senior Market Sales Inc. experienced record-breaking success in 2018, with significant increases in virtually all lines of business. The Medicare Annual Enrollment Period (AEP) is coming soon. Are you prepared and equipped? Your SMS Marketing Consultant can help you hit the ground running. Here’s an AEP prep checklist to help you be ready. Selling Dental, Vision and Hearing (DVH) coverage is a natural extension of a growing Medicare business. Read more about this hot trend in the market, and learn how you can get started. The Centers for Medicare & Medicaid Services (CMS) has renamed the Medicare Marketing guidelines and made significant changes for this year. Here is a summary of the changes, and how they affect your business. Dual Eligible Special Needs Plans (D-SNPs), could be a good way to grow your existing Medicare business. Here are answers to questions commonly asked about D-SNPs.